This table range was commissioned by a Japanese ceramic manufacturer. 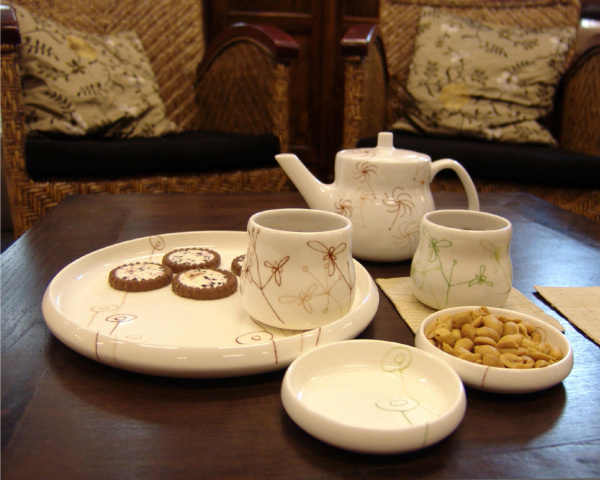 The plates and cups have smooth soft curvy shapes and all sharp edges are reduced for a more comfortable feel. The range may be used at the table but also on floor-pillows on the carpet or lazily in bed. The content stays in the objects even when tilted due to the high rim. The pattern design is draw by a local Japanese designer. The design was exhibited at the London Designers block 2004 and it is manufactured and distributed by Sanyo Toki, Japan.